The Lincoln penny tread depth test has been touted for years to be a suitable method of determining when it's time to get new tires. It's based on the premise you're driving on legal tread depths anytime the top of Lincoln's head is obscured by the tread and that a tire's ability to grip the road isn't greatly reduced in adverse conditions (rain, slush and snow) until the tread wears to about 2/32" of remaining depth. It then maintains you're ready for new tires at 2/32" and can see the penny above Lincoln's head. A driver's ability to control their vehicle depends on the traction between their tires and the road. Tires don't require tread designs or even much tread depth to deliver traction on dry roads. 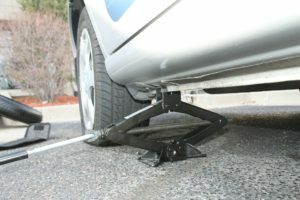 A practical example of this is the racing slicks used on stock cars and open-wheel racers that provide traction at over 200 mph. However, tires do require tread designs to generate traction on wet, slushy and snow-covered roads. Liquids can't be compressed and require time and energy to move them out of the way as our tires drive through them. Those same racing slicks would lose traction at amazingly slow speeds anytime something prevented them from maintaining contact with the road. While replacing your tires before they are legally worn out may not appear the most economical practice, it is far less expensive than repairing your car if it can't stop in an emergency situation in less distance than the vehicle ahead of you! We can offer a high level of service at a much lower rate than other automotive technicians, because where most franchises pay high leasing fees on their property, we don’t.